1 Pulse: What are the patterns of use in Rome? 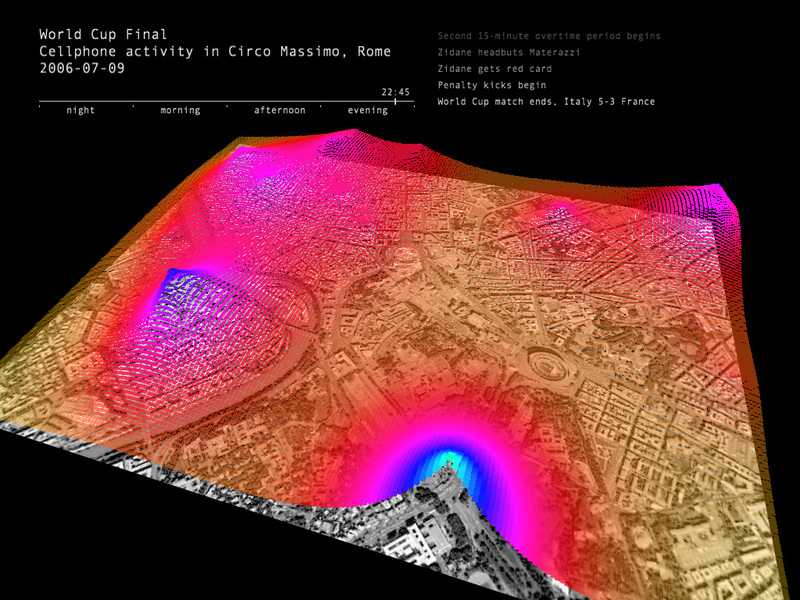 Where in Rome are people converging over the course of a day? 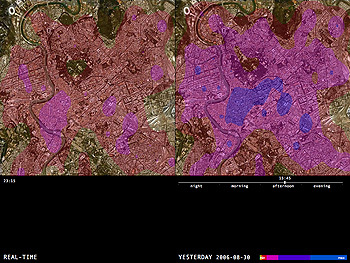 This software visualizes the intensity of mobile phone calls in Rome at the present moment and compares it to yesterday's data. 2 Connectivity: Is public transportation where the people are? 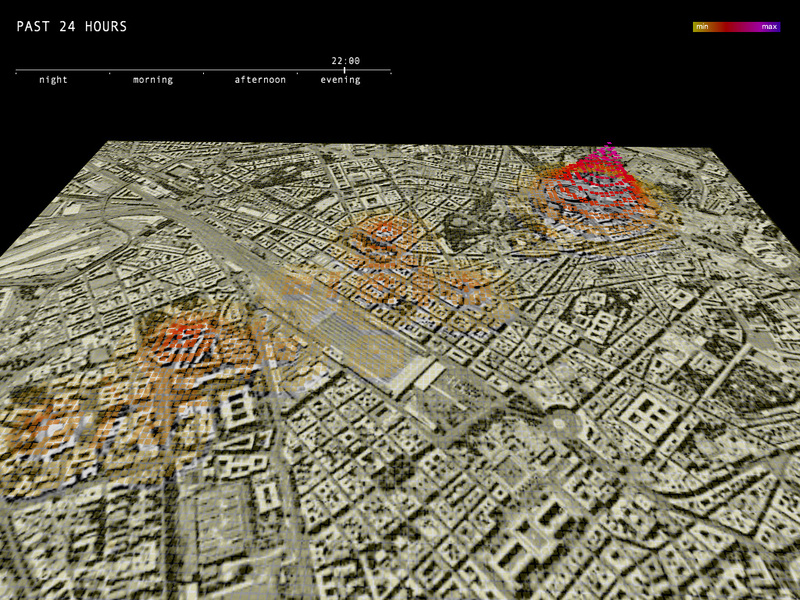 How do the movement patterns of buses and pedestrians overlap in the Stazione Termini neighborhood of Rome? This software shows the changing positions of Atac buses, indicated by yellow points, and the relative densities of mobile phone users, represented by the red areas. If a tail on a yellow point is long, this means that a bus is moving fast. 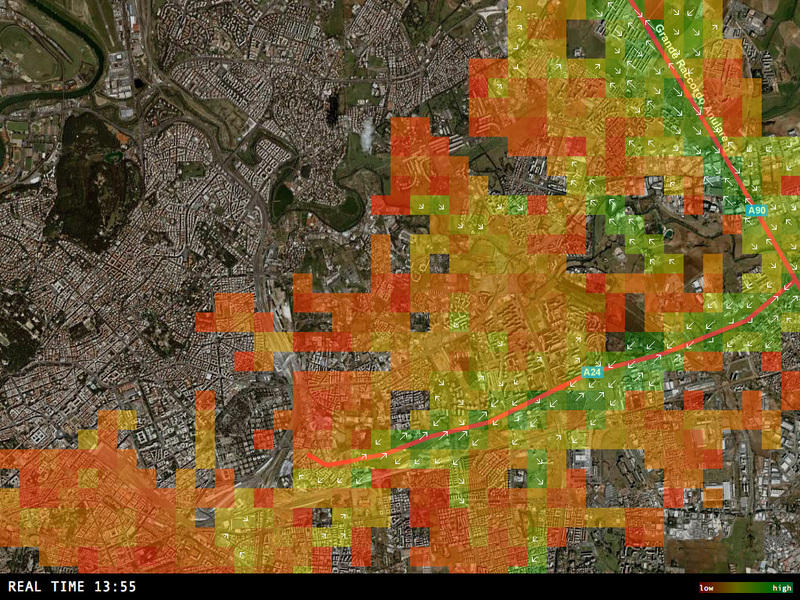 Areas colored by a deeper red, have a higher density of pedestrians. 3 Flow: Where is traffic moving? 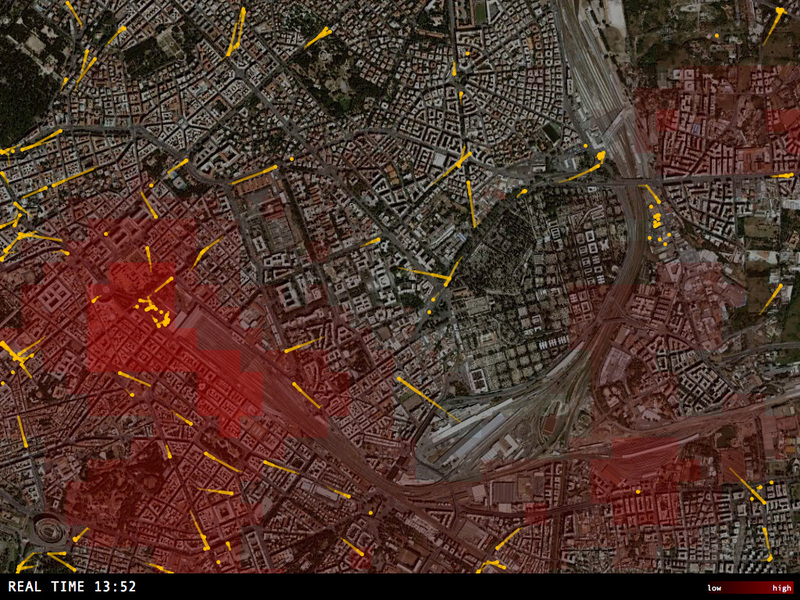 This software visualizes the movement of mobile phone callers traveling in vehicles. It focuses on the area around the Stazione Termini and the Grande Raccordo Anulare (Rome's ring road). Red indicates areas where traffic is moving slowly, green shows areas where vehicles are moving quickly, and the arrows represent the dominant direction of travel. 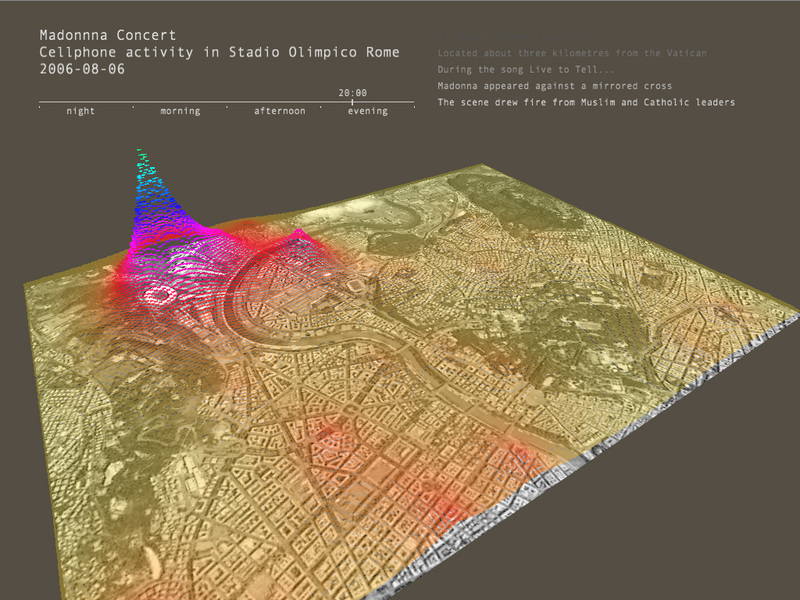 4 Icons: Which landmarks in Rome attract more people? 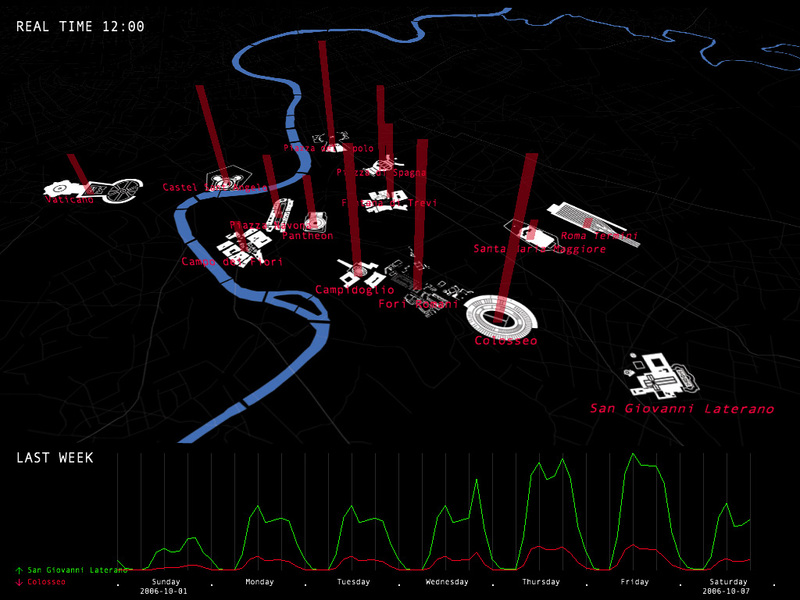 This software shows the density of people using mobile phones at different historic attractions in Rome. The location in green is the most popular, while the location in red is the least popular. The number beneath each landmark indicates its popularity ranking relative to the other areas. At the bottom of the screen is a week-long data comparison between the most popular site and the least popular site. 5 Visitors: Where are tourists congregating? 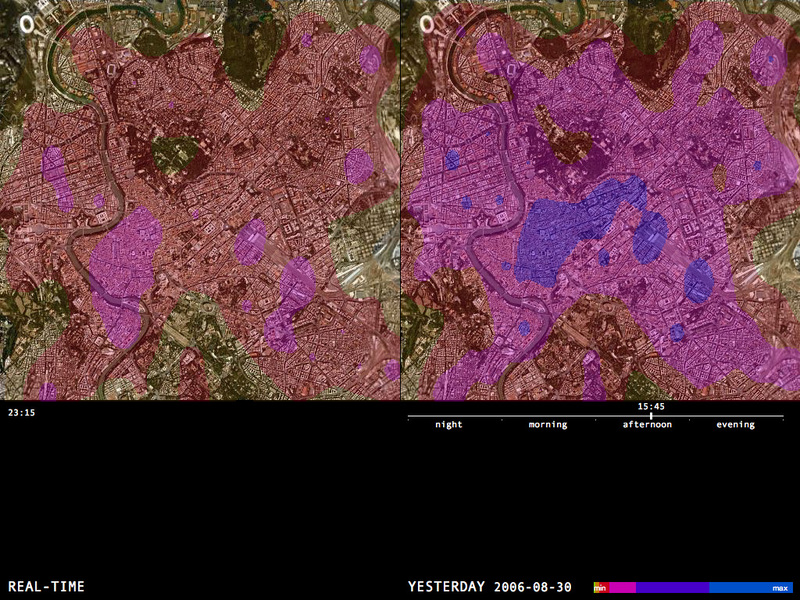 Where are the concentrations of foreigners in Rome? 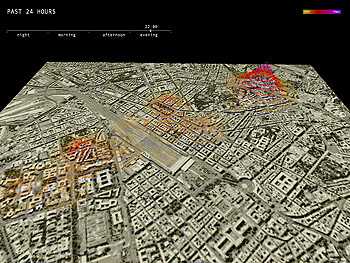 This 3-D software highlights the locations around the Stazione Termini neighborhood of Rome where tourists are speaking on mobile phones. 6 Gatherings: What does Rome look like during special events? + World Cup final match between Italy and France on July 9, 2006 and celebrations at the arrival in Rome of the winning Italy national team on July 10.